For 40 years, the J.C. Hart Company has been developing, building, and managing distinctive apartment communities. The company also recognized the need for long term commitment to quality management services for the residents of our communities. These target market niches and quality management services have become the keystones for the future success of the J.C. Hart Company. make your Home an enjoyable living experience. J.C. Hart is currently building or in development stages for a number of communities. Here is a sampling of properties we are working on today. Penrose on Mass Ave. will consist of 236 luxury apartments, 40,000 square feet of retail, and a 379 space parking structure. Located at the intersection of N. New Jersey St. and Massachusetts Ave., Penrose on Mass is next door to Old National Centre and will rest in the heart of Mass Ave. With retail shopping and restaurants on the main level of Penrose on Mass, the building and community strives to be a destination residents can enjoy in numerous ways. J.C. Hart is excited to partner with Strongbox Commercial and Schmidt Associates as we bring this exciting project to Mass Avenue. Located at East 66th and Ferguson streets, just south of the Indianapolis Art Center, Park 66 Flats will rest in the heart of Broad Ripple. Apartments range from 650 sf for the smallest one-bedroom to 1,200 sf for a two-bedroom. With 1st level parking and rooftop amenities such as a glass-walled fitness center, grilling area. and gathering room, J.C. Hart is excited to bring our apartment expertise to Broad Ripple. 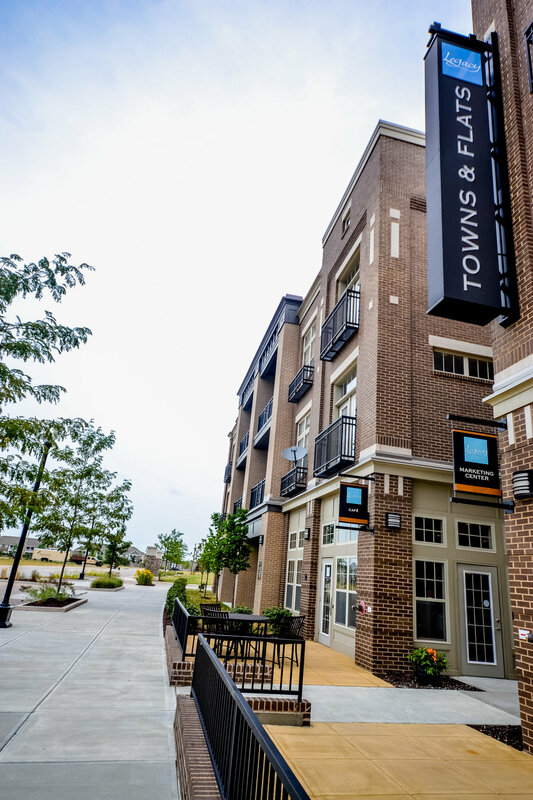 The name of the multifamily project, The Line – Urban Flats on the Monon, intentionally draws upon the history of the Monon Trail, at one time a railway used by the Monon Railroad and known as The Hoosier Line. The Line, located on Westfield Boulevard, north of Broad Ripple Avenue, will have uniquely spectacular views, fronting the Monon Trail to the west and with views of the White River to the east. There will be ground floor space available for lease for retail along the Monon Trail. Old Town Development is the primary developer for the $150 million Midtown East section. Partnering with Ambrose Property Group for the office and retail components and J.C. Hart Co. Inc. for the residential projects. Midtown Flats will consist of 230 units and it will be located on the newly enhanced Monon Boulevard near downtown Carmel. Each property begins from a blank slate. Every new community is unique and distinctive in its site layout and building style, designed to create a one-of-a-kind project for each market place. Our collaborative, hands-on approach to project development, integrated with our experienced Construction and Management divisions, ensures that each community is properly coordinated and managed from site selection, design, construction, all the way through lease-up, property stabilization, and asset management. Look for J.C. Hart Communities in the Indianapolis Metro Area, Bloomington, and West Lafayette. The J.C. Hart portfolio of communities currently consists of 16 communities in the Indianapolis Metropolitan area including Carmel, Fishers, Westfield, Noblesville, Avon, McCordsville, Greenwood, and Downtown Indianapolis. In addition, we have 3 communities in Bloomington, IN and 1 in West Lafayette, IN. The portfolio includes conventional communities built from 1997 to today, consists of 4,648 units, and covers markets and rent ranges that cater to many neighborhoods and demographics.